SIGMA – the Scientific cubesat with Instruments for Global magnetic field and rAdiation – also known as KHUSAT 3 (Kyung Hee University Satellite) is a South Korean CubeSat mission dedicated to the measurement of the global magnetic field via a magnetometer instrument and radiation in the Low Earth Orbit environment via a Tissue Equivalent Proportional Chamber instrument. 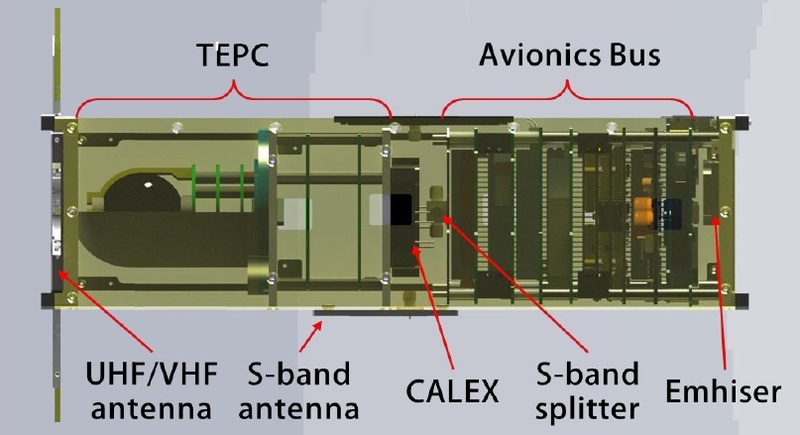 The 3-Unit CubeSat has a mass of 3.2 Kilograms and has the primary task of measuring the Linear Energy Transfer (LET) spectrum and calculating the equivalent radiation dose relevant for human space exploration. The Magnetometer experiment is classed as a secondary objective. 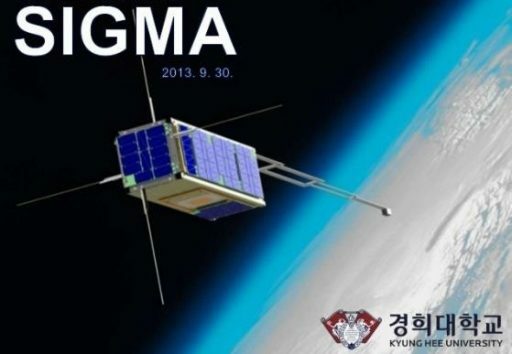 SIGMA is led by Kyung Hee University with participation by the Korea Astronomy and Space science Institute, York University, and the University of New Hampshire. 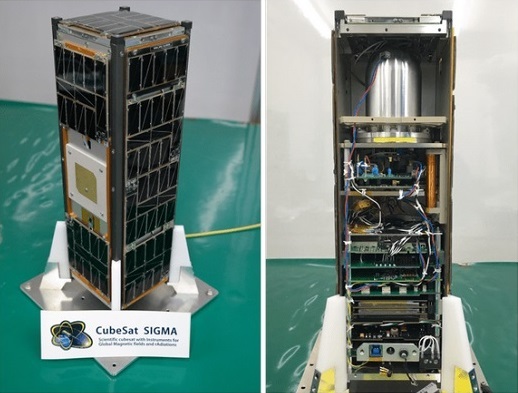 The SIGMA satellite uses a typical 3U CubeSat structure with the addition of a boom on which the magnetometer resides to move it as far away from the satellite’s intrinsic magnetic field as possible to avoid interference. 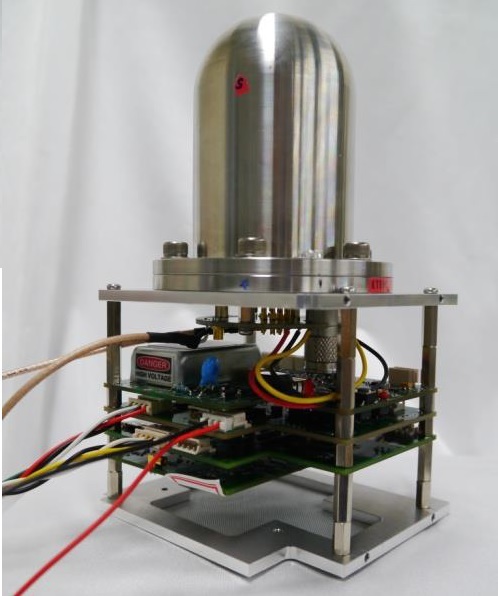 Body-mounted solar cells generate an orbit-average power of 3.77 Watts and the internal satellite structure comprises several stacked Printed Circuit Boards (PCBs) that facilitate the various subsystems. The satellite has a total of 12 solar panels covered with Triangular Advanced Solar Cells (TASC) and a dedicated Instrument Interface Board distributes the 3.3, 5, 8 and 12-Volt power buses to the various users on the spacecraft; the 12V bus is routed to the TEPC payload where a High Voltage Power Supply converts it to the required 1,000 V for operation of the detector. The satellite’s Attitude Determination and Control System employs rate sensors, a three-axis magnetometer and photo diodes for attitude determination and a torque rod and torque coils are tasked with attitude actuation. During nominal mission operations, the satellite will be spun at 4 RPM with the spin axis perpendicular to the ecliptic plane. 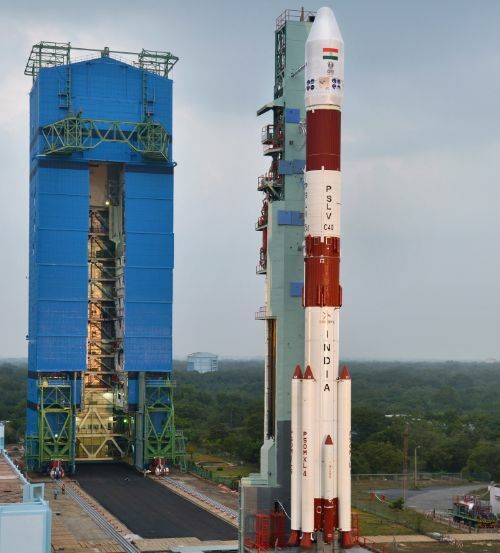 Communications employ VHF at 145 MHz for command uplink at a data rate of 1200 bps, UHF at 430 MHz for telemetry downlink at 9600 bps (both using whip antennas) and the 2.2 GHz S-Band is used for downlink of payload data at 153 kbps through a patch antenna installed on the satellite. The TEPC (Tissue Equivalent Proportional Chamber) is a radiation study that measures absorbed doses of space radiation and determines the real time Liner Energy Transfer (LET) spectrum, and human-tissue equivalent doses for an objective examination of radiation risk to crew members during space flight. An accurate measurement of tissue-equivalent absorbed dose is important because dose management is a crucial aspect for crew members given the radiation environment experienced in orbit is several hundred times greater than that on Earth. Crew members are only partially shielded by the structure of their spacecraft and experience radiation from diverse sources including galactic cosmic rays, solar particle events and trapped particles in Earth’s magnetic field as well as secondary particles such as neutrons that are created when energetic particles are absorbed in the craft’s outer structure. TEPC weighs 1.0 Kilogram and houses A-150 tissue-equivalent material for the wall and a tissue-equivalent SUS-304 gas mix of C3H8 (55%)+CO2 (39.6%)+N2 (5.5%). When struck by energetic radiation particles, the gas is ionized with negative electrons traveling to a gold-plated tungsten wire acting as anode to create a measurable signal which is then digitized and analyzed. The instrument has an energy range of 0.2 to 300 keV/μm. The second payload of the SIGMA mission is a Fluxgate Magnetometer to collect measurements of Earth’s magnetic field vector and field strength to support studies of Ultra-Low Frequency phenomena ongoing in the ionosphere. 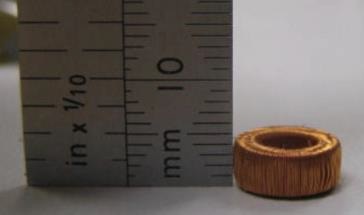 The sensor weighs just 15 grams and is facilitated on a deployable boom of 0.5 meters length. It has a dynamic range of +/-65536 Nanotesla and a resolution of 1nT, collecting eight samples per second for all three body axes. The overall principle of the fluxgate sensors is identical – making use of the nonlinearity of magnetization properties for the high permeability of easily saturated ferromagnetic alloys to serve as an indicator for the local field strength. The ferromagnetic material is surrounded by two coils of wire – one coil runs an alternating electrical current which drives the core through an alternating cycle of magnetic saturation. This changing field induces a current in the second coil which can be measured by a detector. In a magnetically neutral environment, the input and output currents would be identical, but the presence of an external field leads to an easier saturation of the core when in alignment with the core while saturation is less easily achieved when the core is exposed to an opposing field. This leads to the output current becoming out of step from the input which, with the known parameters of the core material and the simultaneous measurement of the input, will provide information on the local field strength using known calibration data.